Ms Ziff has reason to be so high on the image, as her work on the Che icon includes as exhibition that opens this October and a film coming out in 2008. Some people like to debate whether this or that image is the most iconic of them all, but I’m not among them. The question does open up some interesting issues in this case, and I mention them in part because they address an omission in the book No Caption Needed. John and I focused exclusively on the US, as we weren’t prepared to study other national media. We are confident, however, that iconic images play an important role in some other pubic cultures, although not necessarily in all of them. We assume that they will work along the lines we identified but also reflect differences in media, society, and political history. Those differences may be incorporated easily into our theoretical framework in some cases, and in other cases they may require fundamental adjustments. In addition, there also is the question of how icons circulate internationally and help constitute something like a transnational public culture. We are certain that the Che icon is not the most widely circulated iconic in the US, but it may well be internationally. Likewise, the range of appropriations shown in the slide show and flickr link accompanying the BBC story contains nothing surprising to those who know something about how images become iconic, but it could be that they work differently in a transnational context than they would within a more circumscribed media environment. In any case, each icon provides a unique basis for talking about what we see, what has happened, who are are, and what paths lie before us. Indeed, it could well be that there is more than one reason for the Che image to come around again. Update: Today’s New York Times is running a story on the Che icon. They feature Che’s daughter while emphasizing the supposed contradiction between socialist ideal and commercial success. There is tension there, of course, which is one reason the image is iconic. But don’t hold your breath for a companion story on the contradiction between a privately owned newspaper representing the public interest. Nor do they point to a contradiction when quoting an Investor’s Business Daily editorial decrying use of the image as “tyrant-chic.” I didn’t know that the Daily supported moral regulation of free enterprise. They ought to talk with Che’s daughter, who also is concerned about commercial use of the image. 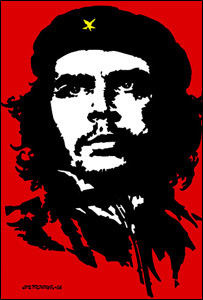 It’s the 40th anniversary of Che’s death, so there will be a number of stories about the iconic image this week. Many of them will follow the conventions for reporting on iconic images, including personalizing the story and fretting about unrestricted circulation. I find it interesting that icons can be used to manage contradictions, and also to expose them.